A team of researchers, led by the University of Minnesota, have discovered a new nano-scale thin film material with the highest-ever conductivity in its class. The new material could lead to smaller, faster, and more powerful electronics, as well as more efficient solar cells. The discovery is being published today in Nature Communications, an open access journal that publishes high-quality research from all areas of the natural sciences. Researchers say that what makes this new material so unique is that it has a high conductivity, which helps electronics conduct more electricity and become more powerful. But the material also has a wide bandgap, which means light can easily pass through the material making it optically transparent. In most cases, materials with wide bandgap, usually have either low conductivity or poor transparency. "The high conductivity and wide bandgap make this an ideal material for making optically transparent conducting films which could be used in a wide variety of electronic devices, including high power electronics, electronic displays, touchscreens and even solar cells in which light needs to pass through the device," said Bharat Jalan, a University of Minnesota chemical engineering and materials science professor and the lead researcher on the study. Currently, most of the transparent conductors in our electronics use a chemical element called indium. The price of indium has gone up tremendously in the past few years significantly adding to the cost of current display technology. 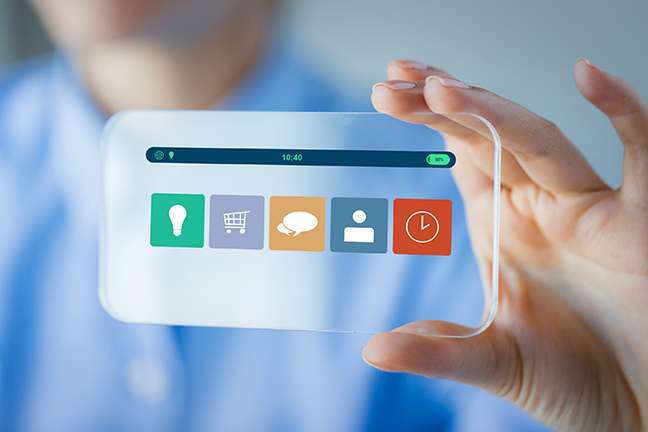 As a result, there has been tremendous effort to find alternative materials that work as well, or even better, than indium-based transparent conductors. In this study, researchers found a solution. They developed a new transparent conducting thin film using a novel synthesis method, in which they grew a BaSnO3 thin film (a combination of barium, tin and oxygen, called barium stannate), but replaced elemental tin source with a chemical precursor of tin. The chemical precursor of tin has unique, radical properties that enhanced the chemical reactivity and greatly improved the metal oxide formation process. Both barium and tin are significantly cheaper than indium and are abundantly available. "We were quite surprised at how well this unconventional approach worked the very first time we used the tin chemical precursor," said University of Minnesota chemical engineering and materials science graduate student Abhinav Prakash, the first author of the paper. "It was a big risk, but it was quite a big breakthrough for us." Jalan and Prakash said this new process allowed them to create this material with unprecedented control over thickness, composition, and defect concentration and that this process should be highly suitable for a number of other material systems where the element is hard to oxidize. The new process is also reproducible and scalable. They further added that it was the structurally superior quality with improved defect concentration that allowed them to discover high conductivity in the material. They said the next step is to continue to reduce the defects at the atomic scale. "Even though this material has the highest conductivity within the same materials class, there is much room for improvement in addition, to the outstanding potential for discovering new physics if we decrease the defects. That's our next goal," Jalan said. The article appears to be open access. To answer your questions, the precursor is hexamethylditin, and by precursor they mean that it is the substance from which the epitaxial crystals primarily grow. In this case "precursor" is a technical term used in epitaxy generally, denoting the primary source of the important material that is incorporated into the epitaxial crystals. In molecular beam epitaxy specifically, doping agents are added to the crystals by projecting molecular beams of them onto the crystals as they grow. The conductivity of some thickness is immaterial; this is thin film molecular beam epitaxy, and the thickness of the film depends upon the size to which the epitaxial crystals are allowed to grow. The conductivity of thin films is typically measured in S/cm, since the measurement technique is to put two probes onto the surface of the film and measure the conductance. The distance between the probes, then, is all that is required to specify the measure. With a conductivity on the close order of 10⁴S/cm, this means that a centimeter of this material shows a resistence of 100 micro-ohms. Looks pretty significant to me, well up into semiconductor territory making it, given its transparency, a really good application in solar cells, and some very promising applications in touchscreens, as the article notes. tWith a conductivity on the close order of 10⁴S/cm, this means that a centimeter of this material shows a resistence of 100 micro-ohms. 10,000 S/cm means the bulk resistivity is 1/10,000 Ohm-cm and since R=p(L/A) placing two probes on the edges of a 1 cm square of the material - let's say the film is one micrometer thick - would result in a resistance of exactly 1 Ohms, not 100 micro-Ohms. Your result would be correct if you had a 1 cm -cube- of the material, which isn't relevant because this is thin films we're talking about. ITO films have sheet resistances around 6-7 Ohms per square with a 250 nm film thickness, of about 1-2 Ohms for the same 1 µm film as calculated above, so the material still compares favorably to ITO, but it's not as excellent as you made it out to be. The reason why the unit for sheet resistance is Ohms per square is because if you have a square of the material, making the square bigger in the L dimension - distance between the probes - also automatically increases the cross-section area A and the relationship L/A remains constant because it is a square - it has a fixed aspect ratio. So it doesn't matter if you have a 1 cm square or 1 meter square, or 1 foot square, the resistance of the sheet is constant if the material and film thickness are constant. The resistance between any two points on the sheet isn't that simple though, and requires some amount of calculus to solve; it's basically the infinite resistor grid problem given to physics undergrads, except it's not quite infinite in reality so it gets difficult to actually compute near the edges of the sheet. @Eikka, the figure is in S/cm and it's from the paper. Siemens are inverse ohms. 10000 S is therefore 100 μΏ. It's a thin film so bulk measures are inapplicable. There are no squares in the units. Where did you supposedly get your degree in EE again? Consider a 1-centimeter cube of material conducting from one face to an opposite face. It has 1 square centimeter of material to conduct with, and a distance of 1 centimeter to conduct the current. The resistance is reduced proportionately to the area to conduct with, and the resistance in increased proportionately with the distance to conduct. So the units would naturally be Siemens per area/length or S/(cm2/cm). But cm2/cm reduces to 1/cm, so conductivity reduces to S/cm. So even though the units of electrical conductivity are Ohm/cm, the thickness is important - a sheet twice as thick would have half the resistance, or twice the conductance (conductivity times area divided by distance). Conversely a distance twice as far would have twice the resistance, or half of the conductance. Ohm/square is a measure of SHEET resistance. My background is physics and "Ohms per square" sheet resistance annoyed my because it is not a pure material property. But I learned to love it anyway when designing circuits because it is very useful for a given material at a given thickness. Conductors in a given circuit board layer or given chip layer are all close to the same thickness because they are made by patterning a sheet of material. 1-micron-thick copper has a sheet resistance of ~17 mOhms/square. Let's say I need 100-micron-long trace to be less than one Ohm. 1000/17 = ~60, so I know that I can have at most 60 "squares" in the wire - in other words, 60 times as long as wide - so the 100-micron-long trace must be at least 1.6 microns wide. It works even better visually on a layer plot - knowing the sheet resistance, I can look at the width and picture a square, and then count the 'squares' in a path and in a few seconds find the approximate resistance. On the scale of a few atoms thickness bulk conductance also typically becomes NOT a constant, and so can be inappropriate. The 31 nm films used in THIS ARTICLE are on the rough order of 100 atomic layers thick, so surface effects are starting to become significant but bulk conductivity is still useful (hence the conductivity being given in Ohm/cm). Another effect is 'skin depth', where the conduction is limited to a 'skin' whose depth decreases as frequency increases. RF designers have to pay close attention, but at 50-60 hertz it affect only big conductors; transmission lines use multiple smaller conductors to avoid skin depth increasing resistance. There is also true surface conductance, but it is not as common. Some topological conductors only conduct at the interface between two materials (or between a material and vacuum). In such cases the bulk conductance is not appropriate because material thickness doesn't influence conductance. The societal implications of this are huge. If or windows and skylights can provide light and power too, why would we burn coal? Storage? It is now becoming practical, not just possible, and we have wind at night. Bah, that's what I get for posting in the middle of the night. You are of course correct, @RealScience. Now I'll take a much more careful look at @Eikka's posts. OK, I had a look, and @Eikka was right. Transmission lines use multiple smaller conductors mainly because the cable becomes mechanically more resilient against bending. The skin depth for aluminium at 60 Hz is almost 11 mm which allows cables nearly 1" thick. That's not a cable but a bar of aluminium - it wouldn't bend. The skin effect is strongly influenced by the magnetic properties of the material. A steel wire exhibits significant skin effect, which is why steel cables aren't used for transmission. The skin depth is only 0.2 mm at 60 Hz which makes it virtually impossible to transmit any amount of AC power through a steel cable.. The higher the magnetic permeability, the shallower the skin depth. I'm not referring to the multiple strands in a given cable (which are indeed for flexibility) - they are so close together that they would not help with skin effect in any case. I am referring to the bundles cables held about 25 cm apart. On the ones near here, each of the four cables is a bit over 3 cm in diameter, so the outer 11-mm conducts, and the 10 mm inside the 'skin' is only ~10% of the volume (and is carbon fiber in newer cables). On a single 6+ cm cable the skin effect would cut its average conductivity in half (and the cable would also have half the surface area for cooling and have a higher voltage gradient at the surface). And why induction stoves will heat magnetic steel but won't heat an aluminum pot - the thick current-carrying layer of low-resistivity aluminum has too low a resistance to heat much under the current that it is practical to induce. Induction stoves do not work by electrical resistivity, but on moving magnetic domains. Induction stoves DO work by electrical resistance, just not the same way a traditional stove does. The changing magnetic field induces currents in the conductive material of the cookware, and these currents have to overcome the resistance of the cookware material and heat the material through resistive losses. In contrast, in a traditional stove burner current from the wall plug runs directly through the burner, and resistance in the burner causes resistive losses that heat the burner, which then heats the pot. Magnetic hysteresis provides most of the heat initially until the Curie Point, which is only reached in the melting of metals, not on your induction stovetop. Magnetic hysteresis can provide heat, but generally is not 'most' of the heat (I have seen several articles that get this wrong, thinking that this is why magnetic materials are easier to heat). The main reason magnetic materials heat better is that they confine the induced (eddy) current to a thin skin, and the thin layer has higher resistance due to being thin. Even a high-conductivity, non-magnetic material will heat if is thin enough that its resistance is high, which is why aluminum foil on an induction stove will heat (see U.S. Patent 3786222 'Metallic foil induction cooking'). The ASM's "Theory of Heating by Induction" (Ch. 2 of #06098) devotes pages to eddy currents and skin effect, but for hysteresis has just one paragraph that says that "a minor amount of heat is produced". The Curie Point can be reached before metal melts. Iron's Curie temp is 1043K, almost 800K below its melting point (and Invar's CP is ~550K, or ~1/3 of its ~1700K melting point). The depth of eddy currents is dependent upon the frequency of the induced field. Yes, for a given material it varies approximately with the inverse of the square root of the frequency (for metals (good conductors) this approximation holds quite well at the frequencies involved in induction heating). The skin effect is also not an all-or-nothing cut-off, but is an exponential reduction (1/e per skin depth)so at half a skin depth the current density is already reduced by ~40%, but even at three skin depths the current density is still 1/e^3 = 5% as much. I have heard of ultra-high-frequency induction stoves that will even heat aluminum cookware, but I have never personally seen one - they would need to work at a high enough frequency to get a thin skin depth even in non-magnetic aluminum. The effect is also used in induction welding of pipes. A steel pipe going through a magnetic coil with high frequency current would at first glance appear to form an eddy current that goes around the whole cross-section of the pipe and heat the entire thing rather inefficiently, but the high resistance caused by the skin effect confines the current mostly into the molten blob at the seam. Sometimes an additional high-permeability mandrel is placed inside the pipe to further increase the impedance for currents going around the perimeter. Another way of looking at the situation is to note that ferromagnetic materials form an opposing magnetic field at much smaller currents than e.g. aluminium, or the molten blob of metal at the weld seam, so it actually shapes the oscillating magnetic field to go through the portion with the least impedance. It's a bit suspect, since the skin depth in copper is shallower than in aluminium, so the coils inside the stove would heat similiarily to the pan. A side effect of induction on aluminium is that it tends to levitate on the stovetop, because the low resistance path for the eddy current allows it to generate a strong opposing magnetic field. The stove tries to turn on, and the initial pulse it uses to detect the cookware flicks the foil off the stove. If it were to apply the full power on an aluminium pan, it would actually throw it up in the air. I 'Googled' the universal induction stove, and the first five hits were all a cheap trick - they just have an iron disk under the pot. I don't see a practical way actually do this without a cheap trick, but it is not impossible to do. There is a well known physics demo with a large aluminium pan actually levitating over a magnetic coil, and it does get hot enough to cook things on. The demo involves cracking an egg on it to point out that it gets hot. An iron pan would be attracted to the electromagnet by virtue of being ferromagnetic, which cancels the levitating force, which is why steel or cast iron pans won't float off your induction stove - aside for being much heavier in the first place. That would also levitate the pan. That's a method used in one of those hoverboard tricks with a skateboard hovering over a metal floor.